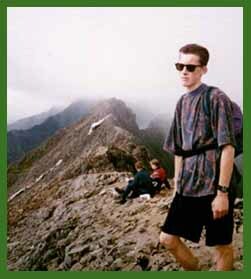 Climbing Mount Snowdon in North Wales via Crib Goch and completing the Snowdon Horseshoe. 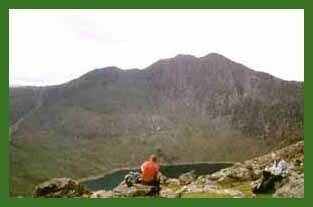 The 1st Climb of Crib Goch. 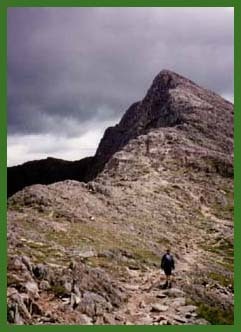 Greg and I needed to climb Crib Goch and Crib-y-Ddysgl, also known as Garnedd Ugain, to complete the Welsh 3000’s and I must admit the thought of tackling Crib Goch, the "Red Ridge", filled me with trepidation. Most of the Snowdonia walking books I had read that referred to Crib Goch indicated that you needed to be an experienced scrambler and, although I’d climbed the other high hills in Snowdonia, I wasn’t sure if my ability was up to it. I knew however I would have no trouble with Crib-y-Ddysgl. 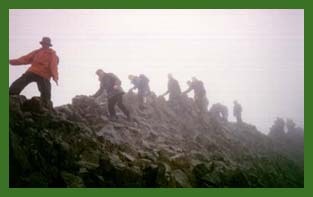 If I had had my wits about me on previous Snowdon excursions I could have walked the short distance from the Llanberis Path, near the top of Snowdon, and "bagged" Crib-y-Ddysgl with the minimum amount of effort and without any concern about "scary bits". 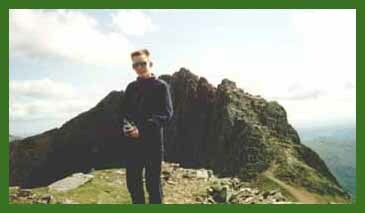 However, Crib Goch would be something different and so it was with real apprehension that Greg and I set out on 13th August 1993 to climb it. 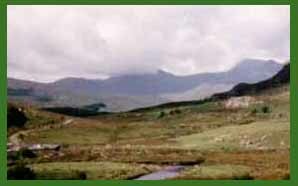 The route was from the Pen-y-Pass car park and followed the Pyg Track to Bwich y Moch – the Pass of the Pigs. This is a wonderful introduction to the mountain. 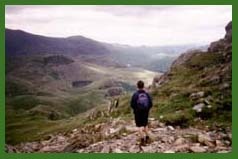 The path rises quickly and as it does you are treated to wonderful views of the Llanberis Pass as it slopes down the hill to Llanberis. With the Glyders on the other side of the pass, with rock faces adjacent to this, it is a terrific panorama and as good as the start of any walk. But it is hard work. Although over the years the path has been improved, and probably even more so since my last trip, you still have to clamber over rocks and it does seem to get steeper as you ascend, so it is with relief when the Pass of the Pigs is finally reached. I’d been at the pass at least 3 times previously and had always looked to my right at the path up to Crib Goch and wished I could go that way, and envied the walkers/scramblers that had left the Pyg Track at this point to go up it. Now it was my turn. The weather was good. The sun was out. The wind was minimal. The conditions were perfect. No excuses. So we ascended the path up to Crib Goch. Initially it is no more difficult than the Pyg Track but I suppose about a 1/3 rd of the way up a "wall" is reached and I remember looking for a suitable route to get past this. However, immediately before this point is a large flat area, a perfect place for a break with wonderful views down to Llyn Llydaw and across this water to the twin tops of Y Lliwedd. A breathtaking sight. Having looked for, and found a suitable route, we were in scrambling territory, and the use of hands became necessary all the way to the top. I particularly remember the final 20 yards or so when I felt really exposed, but fortunately the nature of the rock with many hand and foot holds made it less difficult than it initially looked. On later excursions I made use of a less exposed route to the right of this, which I considered easier. Once on the top we stopped a short time to admire the views from this exposed elevation, but we could not stay at this point forever. 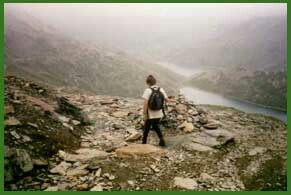 The ridge that we would have to negotiate beckoned. However, with wind now being more noticeable, the drop to the north side of the ridge being considerable and me with no real head for heights, I left the walk along the arête for Greg and the more adventurous. I walked a couple of yards down from the edge on the on the south side of the ridge, the less steep side, using the rocky top "shelf" for hand holds. This technique is ok but there is a temptation to go further down the slope than is advisable, which can create problems. So if I did stray downwards I made sure that I got back close to the ridge route as soon as I could. The next test is the three pinnacles. Maybe because I was down the slope the first two were not that noticeable. I just by-passed them, but the third was something else. I suppose you could by-pass this but being unsure of what difficulties this could result in if I ventured too far down the slope, I followed the correct route. This was not difficult except at one point you step over fresh air. On reaching the other side of this "gap" there is a short scramble of a yard or two upwards and you are over the last pinnacle. And I was most relieved to see below me to the west an easy descent to the Bwich Coch, the col between Crib Goch and Crib-y-Ddysgl. Col reached, we started towards Crib-y-Ddysgl but being unsure of the way we ventured to the south of this ridge when we would have been better going at it from the north side. However, this was soon remedied with a stiff climb to the ridge and then it was a comparatively easy walk to the top of Crib-y-Ddysgl and our completion of the Welsh 3000s. 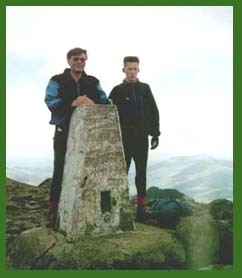 Many thanks to the walker who kindly took the photograph of Greg and me at the trig point on the top. From here it was onwards to the top of Snowdon before descending down to the Miner’s Track. A pleasant walk by Llyn Glaslyn and Llyn Llydaw took us back to Pen-y-Pass with many opportunities to look upwards to Crib Goch and think "we climbed that". 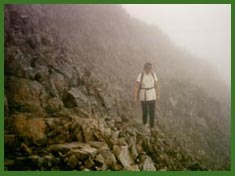 The 2nd Climb of Crib Goch and the Snowdon Horseshoe. 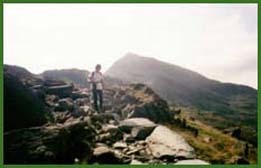 The following August (1994) the family were again in North Wales and Greg and I decided we would "do the Horseshoe". The day was not unlike the one we enjoyed the previous year. The sun was out, visibility was good and we looked forward to another good day on the Snowdon Massif. start to the safety of col (Bwich Coch) before the climb to Crib-y-Ddysgl. there have been a number of fatalities in the past because of these foolhardy actions. 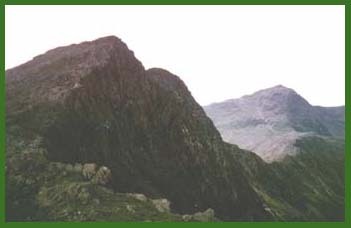 However, we reach Bwich-y-Saethau in safety and in good spirits and enjoy what is a comparatively easy clamber to the top of the West Peak of Y Lliwedd. Although this peak is steep to the south, to the north it is vertical and while we were on the top we could hear a motor whirring. A look northwards and down gave us a view of a helicopter just below the peak. Very strange. I’ve never looked down on a helicopter flying before. From West to East Peak takes only a few minutes and soon after we were descending via Lliwedd Bach and heading towards the Miner’s Track on the south bank of Llyn Llydaw, near the causeway. A mile or so later we are back to the Car park at Pen-y-Pass. It had been a wonderful day. The 3rd Climb of Crib Goch. 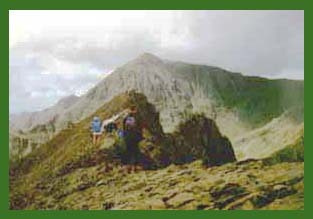 A local walking group, that Larry and Ray walked with, were having a day trip to Snowdon in the Spring of 1995 and Greg and I were able to secure places on the coach. There were to be two walking parties, one to go up the Pyg Track and down the Llanberis Path while the other would try the "Horseshoe". Unfortunately at the last minute Larry had to drop out. In some ways he was very fortunate. The weather going to North Wales was wet. We had rain, lots of it, and it became more obvious the closer we got to Pen-y-Pass, the starting point, that conditions would be very difficult. However, with waterproofs on we walked up the Pyg Track and started on Crib Goch which was even more difficult in the rain. Fortunately it was not too windy and we were able to go over it fairly easily, with me taking my low-level path away from the precipitous north side of the ridge. Eventually we all reached Snowdon and sheltered in the lee of the café - it wasn’t open - and had our sandwiches. However, time was not on our side. The bad weather had reduced our speed and it was with reluctance the party leader decided that if we attempted to complete the "Horseshoe" we would be unlikely to reach Pen-y-Pass on time for the rendezvous with the coach. We therefore decided to go down via the Zig Zags and the top of the Pyg Track to the Miners Track and enjoy a leisurely walk along the banks of Glaslyn and Llydaw, which we duly did, reaching Pen-y-Pass and the coach with 15 or so minutes to spare. 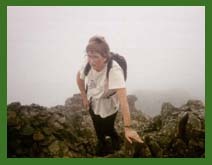 I was pleased to have done Crib Goch again, but rather than feeling elated afterwards I felt more like a "drowned rat". The 4th Climb of Crib Goch. not done it before, agreed to take care of their Mum and so I ventured yet again on to my "favourite" arête. crossed with the fresh air below being replaced by a grey misty gloom. I don’t know if this made it less or more difficult. However, once across this the worst was over and all that was left was the haul up to Crib-y-Ddysgl and then on to Snowdon. Needless to say Anne, like Greg and me the first time we did Crib Goch, was elated with her achievement and enjoyed the route home along the Pyg Track with inevitable self-satisfied glances to the "Red Ridge" above.